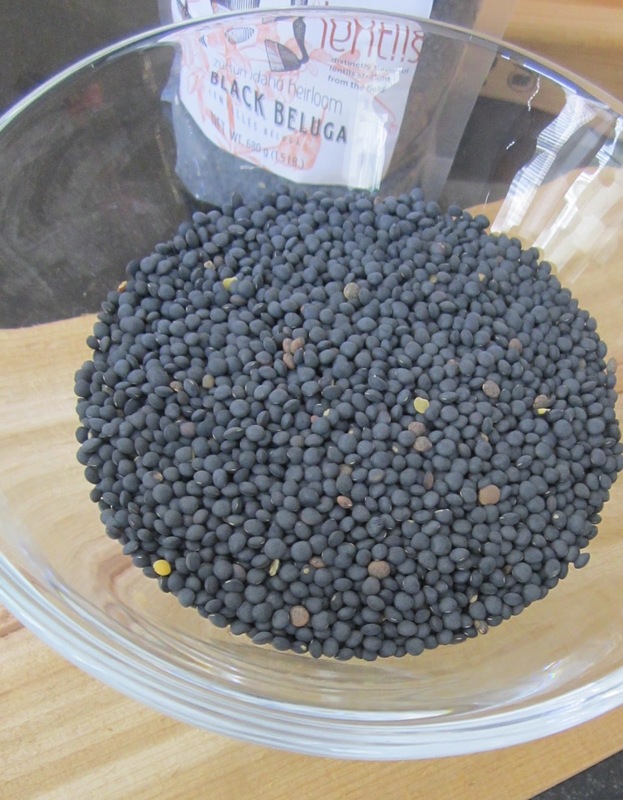 I picked up some beluga black lentils at Williams Sonoma last week. An impulse purchase. They looked and sounded exotic and I'm a sucker for a legume, which I love in composed salads. Slightly peppery and meaty, lentils make a great side or main course. These black beauties were almost twice as much as regular lentils and, in all honesty, I didn't detect a huge flavor difference from their green and brown cousins. Splurge if you fancy this high contrast, dramatic look. Otherwise, I'd stick with the mousier green version (brown doesn't hold it's shape as well for salads), and save your splurge for some great goat cheese to sprinkle on top. The only tricky part of this dish is making sure the vegetables and lentils are cooked properly (until tender). Nothing worse than half-raw potatoes and beets. So be sure to check for doneness. Also, if you can serve everything except the arugula slightly warm, mmm....so much better. 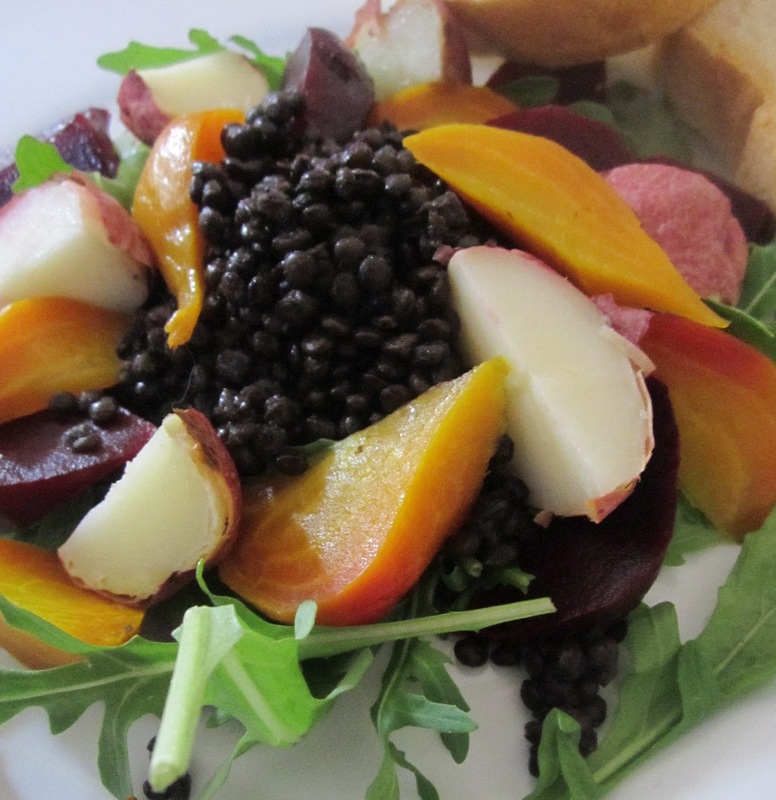 You can make the beets and lentils the day before and store them in the refrigerator, but bring them to room temperature before dressing and serving. If you make the potatoes ahead of time, dress them before refrigerating. 1. Combine garlic, lemon juice, vinegar and mustard. Add olive oil slowly, whisking to emulsify. Add yogurt, salt, and pepper and stir to combine. Add more lemon juice or a little milk to thin if needed. Cover and refrigerate. 3. Scrub and trim the beets. You can peel them now, or after roasting. It's a little easier after and some think they are tastier if you leave the skins on during cooking. Place them in tinfoil, drizzle with olive oil, salt and pepper and a sprinkle of water. Close up foil and place on a baking sheet. Bake for 45 minutes up to an hour and a half, depending on the size of your beets. They are done when a sharp knife slides in easily. Cool just enough to handle and peel, if you didn't do so beforehand. 4. Scrub the potatoes, prick with a fork and place them on a second baking sheet. Roast in oven with beets for 25 minutes or until tender. 5. Slice peeled beets and potatoes (unpeeled) into quarters or eighths. 6. Put lentils in a strainer and take out anything that looks like a rock. Rinse. Mince shallot and saute in saucepan with a little olive oil until soft. Add lentils and 4 cups of water. Bring to a boil then reduce to a simmer for 30-40 minutes or until tender (not mush). Drain any excess water and toss with a few tablespoons of vinaigrette while still warm. 7. Roughly chop arugula and put on a plate. Mound a scoop of warm lentils in the center and surround with quartered beets and potatoes. Drizzle with vinaigrette (and bring some to the table - I like a lot, my family likes less). Top with crumbled goat cheese. With some good bread...a meal in itself.